Loads of Inspirational Alphabet Baby Nursery Theme Ideas to Help You to Create a Fun and Original abc Nursery! An alphabet nursery theme is a great way to introduce your little one to the alphabet and it's a nursery theme that you can get really creative with too. An abc nursery provides lots of opportunities for DIY projects if you are crafty, but at the same time there is plenty of alphabet nursery decor available in the baby stores too. There are many different ways to spin an alphabet baby nursery theme. You could go with bright primary colors, or something more muted with a vintage nursery style. You may want to give your baby nursery a modern alphabet look or maybe you're inclined to do something more fun. Whichever alphabet nursery style appeals to you, alphabet baby nursery theme bedding is a good place to start gathering ideas. If you see a nursery bedding set you like you can base your abc nursery around it. If you can't find an alphabet baby bedding set that appeals to you, don't worry. You can use some of the ideas below to create your own unique alphabet nursery and combine it with any patterned nursery bedding that matches your baby nursery colors. Pink, white and grey for a vintage nursery. Red, white and blue will work if you want to go with alphabet blocks and primary colors. White and black will provide high contrast for a modern nursery design. Or just use a mish mash of lots of different colors - one for each letter of the alphabet. A pile of wooden alphabet blocks. Pillows embroidered with alphabet letters in different colors and fonts. Alphabet books with pictures and big letters. Decorate your nursery using vintage alphabet cards. Get more ideas for decorating a baby nursery with alphabet cards. Paint a wall with a nursery mural of alphabet blocks in a line or a tower or tumbling over the floor. Include teddy bears in the nursery mural to make it fun or spell out your baby's name using the blocks. Cut large and colorful letters out of magazines and make an alphabet collage for the nursery wall. Create a vintage nursery based around antique wooden alphabet blocks and cards. Paint clouds on the wall and paint some of them in the shape of letters. Add small kites zipping around through the clouds with small wooden letters attached to their tails. Instead of kites paint hot air balloons floating through the sky with abc's painted on them in bold colors. Use wooden letters painted in your nursery colors as drawer pulls, curtain tiebacks, doorknobs and ceiling fan pulls. Buy wooden letters in different sizes and fonts and paint them in different colors. Create an alphabet wall. Extend your alphabet nursery theme into toddlerhood by painting the bottom half of one of the walls with chalk board paint. You can draw the alphabet with chalk and later on your toddler can do it too. Hang painted wooden alphabet letters from the ceiling for your baby to look at while he lies in the baby crib or paint them directly on the ceiling. Make your own nursery mobile using wooden letters or stuffed fabric ones or you could use soft alphabet blocks. Hang a bunting across one nursery wall with a letter of the alphabet embroidered on each flag. Cut out pictures of animals from magazines and mount them in frames with the letter that the animal starts with. You can use a similar idea to put together an alphabet baby nursery theme quilt using appliqued animals and letters. 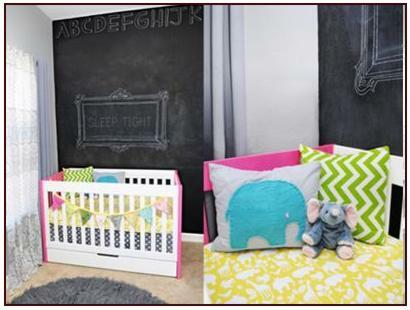 Use decals and wallies to add the abc's to your nursery room design. Create an alphabet nursery border. You can paint it, use alphabet cards or stick up wooden letters. 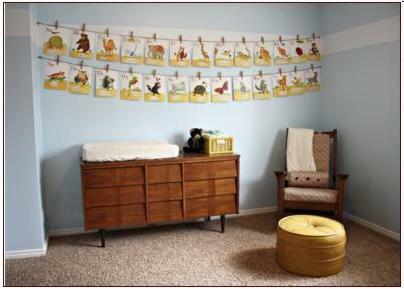 If you are decorating an alphabet theme nursery enter it in our baby nursery photos contest here. You could win a great prize and we will add your nursery to this page to inspire other moms!